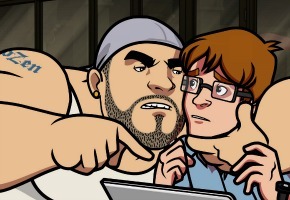 Here’s something different, an animated series about a white gay gangsta rapper named Chozen. The series, which aired on FX in the US is a collaboration between the producers of Eastbound & Down and Archer, but was cancelled after one season. This one is probably more interesting as a curiosity piece than it is funny, but it’s good to see some breaking of barriers. Chozen is an animated comedy about its title character, “Chozen,” a gay white rapper fresh out of prison. Armed with a new message, Chozen is on a quest for redemption and to claim his rightful position as the world’s top rap artist. His music and lyrics take aim at the stereotypes of machismo and misogyny that is synonymous with rap music. And his new world view has been shaped by his time in prison. Mondays from January 5 at 8.30pm on Comedy.